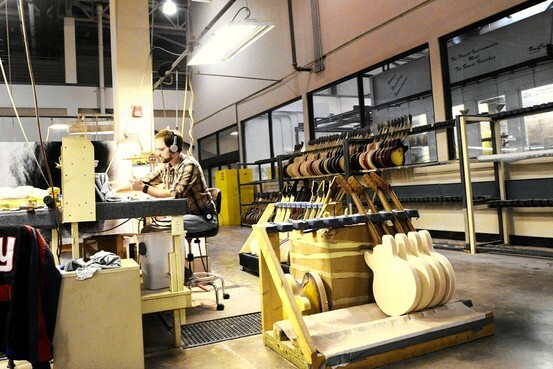 Nashville police are investigating an overnight break-in at the Gibson Custom shop factory, in which several media outlets are reporting that the burglar made off with at least 10 guitars. Officers responded at 4:06 a.m. to a report of a burglary at 1612 Elm Hill Pike, just east of Spence Lane, after a security company responded to the building, confirmed that a break-in had occurred and then notified police. As this branch of Gibson only build custom electric guitars, the minimum price for just one of the stolen instruments have a value of over several thousand dollars. Police said surveillance video shows a man cutting a hole in a fence and breaking in through a door around 3:30 a.m., leaving with the guitars a short time later.